You are currently browsing the tag archive for the ‘USAF’ tag. It’s been a bit since I wrote, a lot of life has happened, a lot of changes, a lot of storms, if you will, and it reminded me of a story that happened a number of years ago that involved a USAF C-130 and yours truly. If you’ve ever seen a military airplane, chances are you’ve seen a C-130 Hercules. It is the short/medium haul workhorse of militaries all over the world that’s been in service for over 50 years. 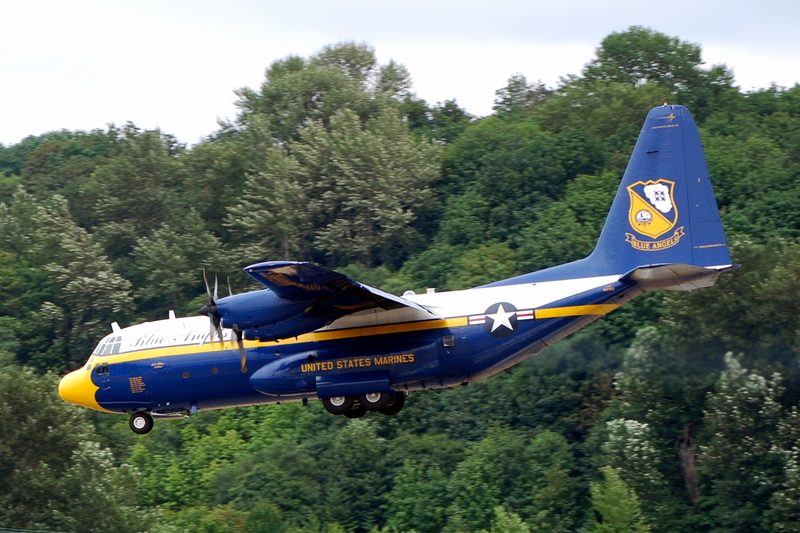 The Navy’s Blue Angels have one from the Marines they call “Fat Albert” that carries the maintenance and support crew to keep all the F-18’s flying. A C-130 landing just a little better than I did. I’ve been in a couple of them, flown over some amazing countryside (Mount Rainier – I’d have pictures of that but I dropped the camera while I was in the cockpit a few thousand feet over Elbe and broke it – the camera I mean) and been in one that was dogfighting with another one (story to come later), but the one that I remember most is the one that never left the ground. See, back when I was in Civil Air Patrol, one of the senior members of the squadron, Steve, was also in the Air Force, and he worked just across the parking lot from where we met every week. What was cool about that place across the parking lot was that it housed two multimillion dollar full motion simulators, one of which was the one for the venerable C-130. What was cool about Steve is that he did the same thing in the Air Force that my dad did years earlier – he worked flight simulator maintenance. Understand, folks who work in maintenance aren’t the people who get the glory. They’re not the ones with high ranks or fancy titles. The people who work maintenance, however, are like the janitor of the school you went to. They have to be able to fix anything. And to do that, they need to be able to get anywhere. And to do that, they have to have keys to EVERYTHING. And Steve, so to speak, had the keys to the C-130 simulator. Now since he worked maintenance, he had to be there all the time, just in case. There were quiet times during his day when the simulator wasn’t scheduled – and of course, over time, I learned what those times were, and just ‘happened’ to show up pretty consistently about then. Over the course of one summer, Steve let me fly the thing – I did the math some time back, and I think I had something like 40 hours in it over those three months. I learned how to start the engines, how to taxi out to an imaginary runway (Steve would play the part of the air traffic controller and give me directions over the headsets from outside), and then Steve taught me how to take off. Now understand – all this is in a full size, full motion simulator that’s an exact replica of the cockpit. You hear the engines. You feel the vibration of the engines. You literally feel the bumps in the pavement you’re taxiing across. It would even have the nose dip as you hit the brakes to stop at the end of the runway before starting your takeoff roll, where you’d feel the bumps in the pavement going by faster and faster, until when you pulled the nose up, you could actually *feel* the nose gear lift off – it smoothed out because it wasn’t rolling over pavement anymore. Then there were the checklists to make sure everything was done right. Landing gear had to come up as soon as the plane was actually climbing. Flaps came up in stages as the plane accelerated, and so on. The one thing it didn’t have was any type of visual display, so because of that, when I learned how to fly, I learned how to fly on instruments only. I learned all that before I ever looked out of the cockpit of a real airplane, and the funny thing is – I learned how to fly the plane not because I had to, but because it was fun. After some time, Steve let me just play a little bit, and I actually got pretty good at running through the checklists to start the engines, the pre-taxi checklist, the pre-takeoff checklist, after takeoff checklist – really, there were a lot of them. One day Steve had most of an afternoon with no one scheduled in the simulator, and I happened to be there, so he decided to have some fun. He taught me GCA’s – or Ground Controlled Approaches – which you do when you can’t see the runway, and the airport has equipment you don’t have. Basically you’ve got two radio beams that intersect like a cross, coming from a couple of transmitters at the end of the runway. One shows you on the right glide slope (both approaching and descending at just the right speed), while the other shows you on the right glide path (coming down on the centerline of the runway). Your job is to keep the plane at the center of those two radio beams– you’ve got someone on the ground tracking you, and their instructions to keep you in the center are short and to the point: “Flight 279, GCA, 3 miles out, on glide slope, on glide path” (what you want to hear) versus something like “Flight 279, GCA, 2 miles out, 500 feet left of glide path, 200 feet below glide slope”. You’ve got a lot of correcting to do in the two miles you’ve got left, flying at about 130 mph, you’ll cover that in less than 30 seconds, while trying to find the end of the runway, which is at the other end of those radar beams. Remember, if you’re doing a GCA, you’re only doing it because you can’t see the runway. This is rather important because usually the runway is the only flat space big enough to land on. It was clear that Steve had a little bit of fun being the GCA Controller, so one day he decided to take it up a notch… He stepped into the back of the simulator where the instructors usually sat – where they had all sorts of evil controls to mess with the crew being trained, and played GCA from right there instead of from his usual console outside the simulator. I had the headphones on as usual, and he decided he’d give me what started out to be a normal approach. I’d had the flaps down to 50% as I needed to have them for that speed, and then he started dialing in some turbulence to make it a little more challenging. Ever flown through turbulence in an airliner? This was just like that – all the sounds, the full motion in the simulator, it was just like you’d expect to feel it in a real plane, just as bumpy, just as uncomfortable, and it suddenly dawned on me that the barf bags in the cockpit weren’t there for decoration. He gave me gentle instructions: first just fly the plane with the turbulence randomly and dramatically trying to flip it right, left, up, or down. My goal was to keep the wings level, and keep it aimed to 340 degrees North-northwest, the same heading as the runway. Then, when he felt I had that mastered, he decided to transition in a GCA controlled approach, meaning I had to not only keep the wings level and keep flying the plane in the storm, but manage all the procedures that were part of landing the plane. He added wind gusts that varied from headwinds (which suddenly gave me much greater lift) to tailwinds (which suddenly meant the plane wasn’t flying through the air fast enough to generate enough lift to keep it from falling out of the sky). Somewhere in there I realized that not only did I have that voice in my headphones to guide me, I noticed that there was an instrument on the panel in front of me that, every time I heard the message, “On glide slope, on glide path” – made a little plus sign, a little cross. It turns out it was what’s known as an ILS, or Instrument Landing System – which is a miniaturized version of the GCA. Instead of a radio and someone in the tower, it’s an instrument in the airplane. See, the GCA is something external to the plane. . It’s sending a – kind of a cross of radio beams out, and they can tell where you are in relation to that. They will tell you what you need to do to be able to land safely. You don’t have to have anything but a radio, tuned to the tower frequency and you just have to do what the voice in the headsets tells you to do. The ILS is a miniaturized version of the GCA. It depends on that same kind of radio beam, but is internal to the plane. Just like a compass always points North, which is a good reference point, this always keeps you pointed toward your goal, which is finishing your flight safely, on the runway. All you have to do is pay attention to it, and keep the little cross centered in front of you, and you’ll reach that goal. But – meanwhile, back in the cockpit, knowing what the right thing to do and actually doing it were two different things. Steve was having fun and incrementally dialing up everything, making the plane climb, bank, and turn, and fall out of the sky all at the same time. It got to the point where just trying to keep wings level, much less doing something complicated like “keep the wings level and the pointy end facing front” was an astonishing challenge. The descent rate wasn’t even averaging the 500 feet per minute descent I was supposed to be trying to do on at that part of the approach. I thought things had gotten as bad as they were going to get, and was really working up a sweat in there… It was no longer a simulation, for me it was real. And that’s when Steve dialed up the turbulence to the point where I was in a full-fledged storm. I wasn’t panicking, but I was working pretty hard to keep things under control, and was concentrating so hard on keeping wings level, keeping the descent rate right, keeping it on glide slope and glide path, that I was caught off guard when Steve suggested I might look at the oil pressure of the number 3 engine. Imagine your check engine light coming on in your car. You just pull over and – well, check your engine. Interestingly, that’s exactly what I was trying to do, but had to wait till I had a successful landing behind me. So I had to slow that engine down, but I couldn’t just pull back number 3. By now the flaps were down, if I recall, at 50%, and the air each of the four propellers pushes over the top of wing, especially with the flaps down, creates a tremendous amount of lift. So if you’ve got two huge propellers blasting air over the left wing, and only one on the right, that left wing will produce way more lift – which complicates things and needs to be considered in everything you do from there on out. So I throttled back not just number 3 (inboard engine on the right wing) but also number 2 (inboard engine on the left wing) to keep the power and lift balanced, with the hope it would last long enough to get us to the ground safely. Complicating that was the fact that the inboard engines blew air over more wing and flaps, and helped create more lift than the outboard ones. There was a good bit to think about in all of that. Steve was impressed, so he held on to the handles mounted for the instructors in the back of the simulator, and dialed the turbulence and the mechanical problems up even more. He added what I now realize were wind shear and microbursts, meaning my airspeed would vary, causing my descent rate to range from “climbing like a homesick angel” to “falling out of the sky like an anvil with wings”. I brought the flaps all the way to 100%, which increased lift, but also increased drag, slowing the plane down, requiring extra power (which I didn’t have much of) to stay in the air. While I was working on the approach checklist, and right as I’d gotten getting the gear down, increasing the drag yet again, and requiring more power to overcome, Steve was slowly dialing the oil pressure down in number 3, and eventually I had the engine in flight idle (lowest speed I could set it to). At this point, my options were getting even more limited, because not only did the oil pressure keep going down, but the temperature started going up. That’s when Steve added the smoke – real smoke in the cockpit. I have to tell you, if nothing else had my attention, the smell of hot oil on top of everything else did. Number 3 didn’t show that it was on fire, but it was showing it was overheating, and it was clear that running out of oil to keep it lubricated and cool was going to guarantee a fire, the only question was if it’d happen before I got to the ground or after. I realized there was only one thing I could do to keep that from happening, so I reached up above the windshield, between the empty copilot’s seat and mine, and flipped the switch to arm the fire extinguishing system. I feathered the prop and pulled the fire extinguisher handle, shutting that engine down, and if nothing else, preventing a fire. That solved one problem, but created several more. I was still trying to land in a storm, but now I was down 25% of my power, and I was right close to stall speed. That was when Steve decided to up the wind shear a bit, and I felt the plane lurch, then saw the instruments show I’d gone from a headwind to a downdraft and I was sinking fast. Sinking fast when you’re flying is not a good thing. Sinking fast when you’re almost not flying is a very bad thing. Sinking fast when you’re almost not flying, close to the ground, is a sentence that often has a fireball for a period. I simultaneously slammed the remaining three throttles to the firewall, and turned the yoke all the way to the left and stomped on the left rudder pedal to try to balance out the asymmetrical lift and thrust I knew I’d be getting because of number 3 being out, and stopped sinking. In spite of that, it moved me to the right of the glide path, so I banked left (which is actually hard to do since I had more power and lift from the left wing) and had to get back on the glide path, just as I heard Steve’s calm voice inform me that I was below I was 200 feet right of glide path, and definitely below glide slope. All the while, Steve watched from the back, saw that I was close to making it, but I still wasn’t out of the weather, and just as I was about to touch down, I got another hard gust from the left. I firewalled the throttles again to try to keep from hitting too hard, but we were too close to the ground for it to help enough in time. I did hit hard, felt and heard one of the tires in the right main landing gear go, pulled all three engines to ground idle, then the standard thing to do would be to lift all the throttles straight up, allowing me to pull them back further, changing the angle of the propeller blades so they’re blowing air forward to slow the plane down once it’s on the ground, not backward to keep it flying. Had I done that with all three remaining engines, I would have put two engines on the left wing and one on the right into full thrust reverse, adding “pirouetting down the runway” to my list of accomplishments on that flight. I decided, instinctively to let my middle finger loose and leave the number 2 engine in ground idle and reverse numbers 1 and 4, which slowed the plane down without the pirouette until I was able to use the brakes and get off the runway. It made me smile, sitting there, back all sweaty against the pilot’s seat – slowly starting to shiver from the abundance of adrenaline and the air conditioning I was just now starting to feel. It’s said that any landing you can walk away from is a good landing – and this one was one of them. The whole thing about this adventure we call life is like that adventure in flight in that simulator. There are times when our lives are CAVU (Ceiling And Visibility Unlimited). Times when you are as free as a bird, where not only the valleys we struggle through, but the mountains and clouds that seemed so high, are now beneath us. Those are times to cherish, because in those times, you gain perspective, understanding, and wisdom. You’re able to see the other side of the clouds, the side where the sun always shines. Other times, life throws us into storms, and the things we hold dear, the things we depend on for support, for power, for strength are shaken to the core. I got to thinking about those engines, and the one that was causing trouble and catching fire trying to land in that storm – and I had to just let it go and shut it off, then figure out how to go on without it. Those aren’t times where you gain perspective. Those are times where you gain experience. It’s the transitions that are often challenging. We have to compensate for things that have been damaged, and flying through the storm becomes quite a bit harder when we lose things we depend on. I realized that while I’d learned how to instinctively fix something while still compensating for my weakness in the simulator, (slamming those three throttles forward when I really needed four, and stomping on that left rudder while turning hard left to keep the strength I did have from pulling me off course), that that’s a constant lesson in real life. I got to thinking some more about it all, and how hard flying through that storm was… You couldn’t see anything out the windows of the simulator – it was nothing but instruments – but if you were flying in a storm, you wouldn’t see anything anyway. If we look inside, at our instruments, if you will – there’s more clarity, and while doing that GCA, I had that voice in my headsets guiding me along that cross in the radio beams, and that dotted cross on the instrument panel, and the third one over the top of that, guiding me on the inside. When I was where I was supposed to be, the three crosses became one. I learned that if I focused on that cross, and listened to that voice, it would guide me through any storm. It was a lesson in trust. I couldn’t trust in my own instincts. Even when the storm headwinds caused me to go higher than I wanted to go, or the tailwinds caused me to sink lower than I wanted to be, even with that engine threatening to burn a wing off. Being so close to the ground and so slow that any mistake could be the last one, hard as it was, I had to trust. Getting too far to one side or the other for too long, and pretty soon it’d be impossible to correct for in time even if I made a massive correction to try to get to the runway, so I needed to trust. Take care folks – and for those of you who celebrate it, have a wonderful, blessed Easter. At first Heidi didn’t know what she was part of that evening. She refilled our glasses, she kept the food and drink coming, and then she did what all good waitresses do. We were sitting in a nondescript restaurant, the three of us, sharing stories, memories, and laughing ourselves silly. J.C. as we knew him, looking out the back of a C-130 high over somewhere. Photo copyright by and used with permission of the Masura Family. …who’d been our commander many years earlier when we were all in the same Civil Air Patrol Squadron on what was then McChord Air Force Base. J.C. had been a loadmaster on C-130’s and C-141’s, back in the day, and up until recently had run an aviation maintenance facility at an airfield near his home. Of the three of us there in that restaurant after the funeral and reception, there was Aaron. The most vivid memory I have of Aaron was when we were trying to ram him through the bushes (<–story) on one of our searches. This evening, however, he was sitting across the table from me, in a uniform that spoke of honor, valor and courage. A uniform that spoke of someone who no longer needed to be pushed through bushes, but led people through walls. As we sat there, reminiscing, and as Heidi kept our water glasses and plates full, Aaron told stories that had us laughing, and shaking our heads in amazement. He told of coming back from one of many missions to a country in the Middle East, ‘the sandbox’, exhausted to the core, and climbing onto a ubiquitous, anonymous Air Force cargo plane that was to take him home, only to find himself being welcomed onto the plane by a loadmaster with the familiar name of Masura stitched to his uniform. It seems J.C’s oldest son (we knew him as Jimmy) had followed in his father’s footsteps, and was now a loadmaster himself, with enough stripes on his arm to put the fear of God into even the highest ranking officer. Aaron, the highly decorated soldier, slept most of the flight home, watched over not by a stranger, but by a friend. Heidi came by about then to refill our glasses, and it was obvious to her that she was seeing, and was part of, something very special. It was obvious we hadn’t seen each other in a long time. Typical of such reunions, she said, was folks from college getting back together. She was amazed to hear that we hadn’t seen each other since high school, and even more amazed that we’d gotten together at all. Then there was Bill, who I’d been able to keep in touch with a little more. I have many memories of Bill, some of which have actually been written down. One of those involved our Civil Air Patrol Squadron, a regional Drill competition (<–story) in Oregon, and the memories of the looks on people’s faces when they saw us beating them at their own game. Bill was dressed in a suit jacket and tie for the funeral, had become a world traveler, working as a biologist and traveling to every continent on the planet, and some places that don’t come remotely close to being continents. Bill told a story about going back to Antarctica, where before they could study the penguins, and the wildlife, one of the first orders of business was getting things habitable, and during that time it was discovered that the ‘facilities’ had been buried in 7 feet of snow since they were last there. By the time they got everything dug out and opened up for use, they discovered several inches of frost on the toilet seat. We’d get post cards from Bill every now and then, telling of his adventures in warmer climates, too. He told one story – and it wasn’t even a story, but just a vignette, of writing one of his post cards, in this case to his sister, sitting under a tree somewhere in Africa, and writing it by candle light, because it was all he had. When a scorpion crawled across the postcard as he was writing it, looking for bugs that might have been attracted by the candle, he decided it was time to call it a night. Heidi came back and checked on us, and the stories continued. I’d had some of my own adventures – some of which I’ve written about, some not, and we marveled, literally, not just about the various journeys we’d gone on to get to this table, in this restaurant, but the fact that we’d survived them all. Even though we were there for hours, each one of us had stories that there wasn’t time to share that evening, and each one of us had stories of adventure and danger, as well as growth and promise that we realized would have to wait for another day. We pondered that, and found ourselves all taking a collective breath. As we did, we realized the restaurant had grown quiet. There was no conversation, no bustling of waiters. In fact, the only sounds we heard were those of clinking dishes as the staff cleaned up the restaurant, which had closed around us. We were the last customers in the place, and the doors were locked. …and stood in the parking lot for another half hour, talking and shivering in the dark, but vowing that we would get together again without someone having to die in order for it to happen. There were friends who were not able to make it this time, and friends who would not make it, ever. Why do we wait so long? I mean – the three of us hadn’t been together in over 3 decades. Me surrounded by two world travelers, Bill on the left, and Aaron on the right. Not a week later I had occasion to go to a friend’s birthday party. I was fighting off a bug and wasn’t feeling too well yet, but for heaven’s sake, it had been years since I’d seen him, so I went. He’d hit the big 5 decade mark, and wondered the same thing… why do we get stuck in our little ruts? I know the answer to this – and there’s a story in it, which I’ll tell later, but in a nutshell, it’s because it takes more energy to get out of a rut than it does to fall into one. Sometimes that energy comes because you see patterns and realize if you don’t change something, the pattern is pretty predictable. Sometimes the energy comes in the adrenaline fueled by the sudden, tragic realization that nothing lasts forever, and everything, everything comes to an end, whether we want to believe it or not. So – and I’m realizing I’ve been ending a lot of stories with this theme: Make sure you let the ones you love know that while you can. Hug your parents. Even if it’s a verbal hug, with a phone call, card, or email. A friend wrote recently that he’d found out another friend had passed away, and somehow 10 years had slipped by since they’d talked. You never know when your last words with someone will indeed be your last words with someone. Sometimes a telephone call will reopen doors to old friendships. Sometimes you’ll find those doors have closed and it’s time to move on. That might hurt, but regardless the door’s position, at least you’ll know, and you’ll be able to open or close it yourself. And you’ll actually have a chance to know what those last words with someone will be. Make sure they’re good ones. In the end, what changed is that I did just that. I picked up the phone and checked up on some old friends and kept in touch with them more. I found some doors opened wide again, and found some doors closed – I write all this from experience, both joyful and painful. And I tried, as best I could, when I saw that one of those doors had closed, to make my last words good ones. So take care of yourselves. This is the one time we have through this life. Take care of each other, too. You never know when you’ll need each other. Oh, and if you happen to meet a waitress named Heidi, working at the Outback Steakhouse in Puyallup, Washington, who keeps your glasses full and allows you to enjoy your reunion time with your friends, give her a good tip. It’s been a year since the events in this story unfolded, and it took this long to think them through, get some perspective, apply some of the lessons I learned, and be ready to share them with you. That might make a little more sense now that you’ve read it. Aaron is still in the Army – he invited us to help celebrate his promotion recently, and we shared more stories, more laughs. We kept the promise to get together more often, and made more promises to do it again. Bill and I got together the day after my birthday last year along with another friend, Mark, and have kept in touch more. He’s doing a little less exploring, but still doesn’t have a “desk” job. He couldn’t make it to the promotion party because he was strapped into a small airplane, flying around the hinterlands of the country in an airplane, counting Elk. Jimmy’s still in the Air Force, I saw him at Aaron’s celebration, and they got along like the old friends they are, not with the stuffy formality you might expect of an officer and an enlisted man. It was fun to see that. J.C.’s wife – well – widow – hard to write that, but it’s true – is doing all the things you do when you’ve lost a loved one. That first year, I can tell you from experience, is a hard one. I’ve kept in touch with them as I could over the last 12 months, not as much as I’d like, but far more than the previous 30 years or so. And as time, and the years, go on, I’m realizing more and more that the things that are valuable to me are less and less the things that gather dust, or rust, or whatever. They’re the relationships I treasure with friends old and new. We were in Eastern Washington a few weeks ago, and brought home a couple of boxes of the world famous Washington State Apples. It got me thinking about all the wonderful things you can do with apples. You know, apple sauce, apple pie, my favorite apple crisp, or just simply baked apples. You don’t need anything special to bake apples, You can bake them in a dutch oven over a fire, or in a regular oven, or like my sister did a while back, in a microwave. She cored them, put raisins and brown sugar in the hole, then nuked them in the microwave for a few minutes. The smell was absolutely divine, the kind of smell you want to come home to – and the smell would make even the rattiest shack feel like home, no matter where it was. I found myself pondering, and realized my mind had drifted off to a story my dad told about another box of apples and a baked apple recipe that had some rather special requirements. Dad was in the Air Force, and worked in Crypto, that is, codes for the first few years there. The Air Force had trained him, and then sent him to where codes would be used, a lot. Now given that this was during the Cold War, the hot place to be code-wise was actually a very cold place to be geographically, and that was as near as possible to the transmitters where the codes were being transmitted from. That place was from what was then the Soviet Union. The closest thing the US had to those transmitters were some of what were the most inhospitable hunks of real estate on the planet, that being a part of Alaska known as the Aleutian Island chain. The hunk of real estate dad was stationed on was an island almost at the west end of the Aleutians. The Aleutian Islands came as a package deal with Alaska when the US Secretary of State William H. Seward bought it from the Russian Government in 1867 for a little more than $7.2 million, or about 2 cents an acre. There were some who thought that was a touch expensive for the land once they saw it. In fact, there were some who thought the land was so remote that it would be too expensive even if it were a straight-out gift. However, Alaska proved its value in the gold rush of 1896, and the Aleutians were also considered valuable strategically – even as far from anything as they were. I mean seriously, the Aleutian chain goes out west so far that you can see tomorrow from the end. In all reality, today should be tomorrow in the middle of them, but the International Date Line zigzags around them so they can all at least be on the same calendar day as the rest of the United States. Not only that, some of the islands of Alaska are so far west, and thus so close to Russia that you can see it from there. They were fought over by the US and the Japanese during WWII, and there have been persistent rumors that some of the islands had a few visitors from Russia during the Cold War. It’s hard to grasp how far away Shemya is from – oh – anywhere, but one fellow stationed there put it into perspective. See, using the common denominator of a McDonalds as a sign of how close or far you are from what we consider “civilization”, in the lower 48 states (that is, the continental United States) it is physically impossible to be farther than 115 miles from a McDonalds restaurant. 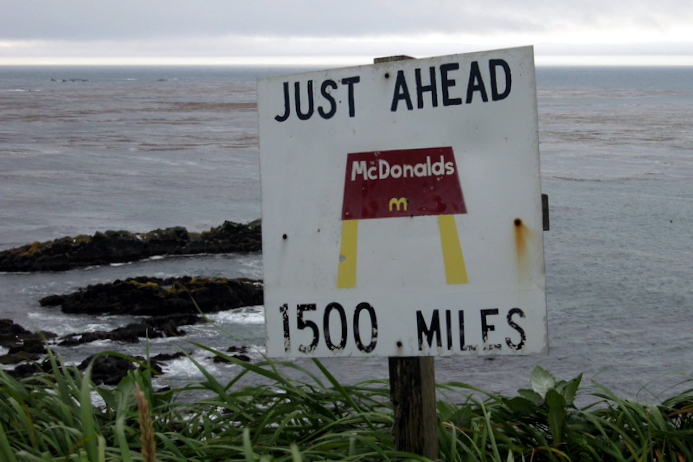 But there’s a sign on the east end of Shemya that makes it very clear that a Big Mac is not in your immediate future. At that point, you’re 1500 miles from the nearest McDonalds. That’s how far out there Shemya is. On the East end of Shemya is a reminder of how far from Civilization you really are. So because of this remoteness, and because supplies had to be shipped thousands of miles across the North Pacific, they had to be ordered months in advance of their planned use, and given the quantities needed and the difficulties in delivering them (due to both distance and the often inhospitable weather), they were brought in infrequently by barges in loads that included up to a six month supply of everything from food and fuel to paint and paperclips. One barge bringing in fuel was grounded in bad weather and was simply left there. The fuel was pumped out, and over the years, what remained of the barge was cut up; the usable pieces were cut away to be used for repairs that required hunks of steel. The old adage of “Use it up, wear it out, make it do or do without” was very much a part of life on the Aleutians at that time, and soldiers, sailors, and airmen learned to make do with what they had, even if it showed up as steel in the form of a grounded barge. What they had back then were either the bare basics, and sometimes even those were hard to come by, or an astonishing amount of stuff worn out from use or weather left over from World War II that was cheaper to leave there than it was to take back to the lower 48. They got into everything, chewing through walls and getting into supplies. Some, searching for warmth, even got in bed with some of the soldiers stationed there. They had to be dealt with. Over time, as more and more equipment was brought out, the various outposts in the Aleutians became more ‘civilized’ – but there was no letup on the fact that you were far from home. By the time my Dad got up there, buildings were made of brick and cement and were definitely built to handle the weather and climate. He spent a little bit of time on an island called Adak (where the rainbow of rats were), but spent most of his time further west, on an island called Shemya. And out there, the weather was routinely so bad that the standard issue wind sock had worn out and had been replaced with a far more durable one. The reason dad was out there was because out there was some of the most advanced and powerful electronic equipment of its time. 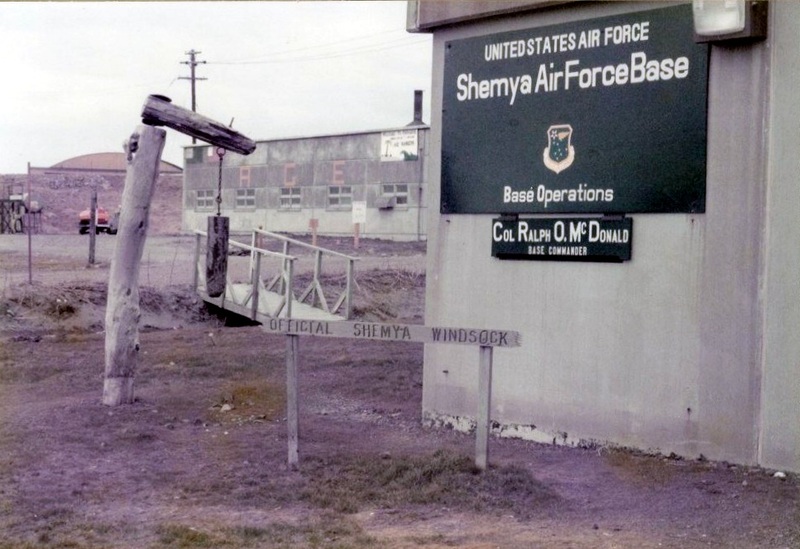 Not only were there electronic listening posts (receivers), but there were electronic transmitters, and on Shemya, there was a radar unit. This radar unit was huge. There were several there over the years, but one in particular held some fascination for my dad and his compatriots. It was the radar known as the AN/FPS-17 – at the time it was among the most powerful radars in the world. Now because of all the tremendously expensive electronics that were out there, the buildings and control rooms they were in had to be dry. In fact, the various buildings were heated by a combination of all the electronics that were in them, the huge oil burning heaters that were running constantly, or both. So as cool and damp as the air was on the outside of the buildings, it was warm and dry, although a bit stuffy, on the inside, since they recirculated the air they’d warmed up. So if it’s not clear yet, because of the remoteness of the location, the complexity of resupply, and the incredibly unpredictable weather, they were very conservative with their supplies, trying hard not to waste anything, and given that weather, the radar unit took several years to build, so remember that they only had what had been brought up on the latest barge. If, for example, one of them got a hankering for a hamburger, and there wasn’t any beef on the island, there wouldn’t be any burgers in the buns. If, on a cold day, one of them wanted a mug of hot chocolate, and it was stuck on the barge that was waiting for the weather to clear, well, he went without the hot chocolate. …like when the fog was so thick you’d need a chainsaw to get through it. …or when the mist was so heavy you needed to lift it with jacks just to walk under it. …or when the cold was so bone chilling that the fact that you were out in the middle of nowhere was overpowering, and as much as you might have just wanted something simple from home back then, if it wasn’t on the island, you weren’t getting it unless months before, someone had thought to put whatever that was onto a barge to be shipped up to Shemya for the once or twice yearly resupply missions. So… whether you liked it or not, the options were pretty limited, and you made do. But the longing for something familiar, the homesickness – even though they’d never call it that, would just get to be so overpowering as to be debilitating. Everyone from the commander all the way down to dad and his fellow airmen realized that keeping morale up was important, that bad morale could be dangerous that far from anywhere, so jumping on any bout of homesickness right away was pretty important all the way around. And going outside helped sometimes. The air was so much fresher than the dry, overheated, electric air inside the control building around the radar and communication processing equipment. For the most part, you could walk anyplace that wasn’t fenced in. You could go down to the beaches, or on the north side, to the cliffs. There were caves to find, of all things, gemstones in. One of the fellows stationed there found some Jade in one that he made into earrings for his wife. Another found a walrus tusk on the beach that he gave to his wife. Both still have them to this day. So you had a lot of freedom to ‘get away from it all’, as much as you can have on an island, but even outside, if you got close to the radar antenna, you could actually feel the electricity. In fact, along that note, the instructions had been pretty clear: you stayed out of the radar beam, and as they were testing it, after the thing had been on for a while, it became clear to even the least technical of them that there was one place on the island you didn’t want to be, and that was in front of that radar antenna. Well, it was simple things, like the grass on the hillside in front of the radar dying after it was turned on. And when there was snow everywhere else, there wasn’t snow in front of the radar antenna. Someone also noticed that seagulls tended to drop dead if they hung around too long in front of the radar antenna. And with the weather occasionally socking the place in with, sometimes you were stuck inside and couldn’t go out at all, even if all you wanted to do was watch the seagulls. About that time, the combination of the boredom and the isolation got to one of the fellows. The almost constant fog, the cold, (it rarely got above 50 degrees, even in August), the wind, even though it brought some of the cleanest air on the planet (that is, when no one was testing Atom bombs in the vicinity) started getting to him. It was just so isolated, and after a number of months of mind numbing work, boredom, and loneliness, the fellow was simply homesick, and mentioned that he had a craving for the one thing that reminded him of home, and that was the smell of baked apples. The other fellows, my dad included, realizing the beginnings of that homesickness, thought, “Baked apples our friend wants, baked apples we can provide.” So one fellow took the four wheel drive pickup they had down to the mess hall and got a crate of apples. The others pondered which of the hot pieces of electronic equipment they could use to warm the apples up on. And then, as they talked, they looked around and realized what they were standing next to, started putting two and two together, and realized that thousands of miles away, Dr. Percy Spencer, the inventor of the magnetron tube that was used in the huge radars on the island, had melted a candy bar in his pocket just a few years earlier just by standing next to one of the very first ones made. Curious about the candy bar, he tried it again with popcorn. This time with it not in his pocket, he blew popcorn all over the lab he was working in, and later literally got egg on the face of one of his coworkers as he exploded the very first egg with microwaves. Well, no one’s sure anymore who came up with the idea, but given the rudimentary supplies they had available to them (remember, what was up there came on a barge, and not very often, at that…) they started thinking of Dr. Spencer’s invention and realized that he was dealing with an itty bitty magnetron tube that was melting candy bars, popping corn, and blowing up eggs from several inches away. Dad and his buddies were seeing dead grass, cooked seagulls, and melted snow a half mile away, and without even taking the apple crate out of the truck, they devised a cunning plan to perform some ‘emergency maintenance’ on the radar unit with the dead grass and seagulls in front of it, and it was shut off. The constant humming that had become background noise completely disappeared. The crackle in the air was gone, and that feeling you get of just being around so much electricity was simply not there. The huge Fairbanks-Morse diesel generators that had been straining to create the electricity to run this radar were suddenly just loafing. You could hear the wind whispering through the antennas. You could hear the seagulls calling. Over the hill, if the breeze was right, you could just barely hear the ocean, and the walruses and sea lions arguing about whose turn it was to be on that particular hunk of rock. And then all that gentle background noise was shattered by the sounds of a rusted out muffler on a four wheel drive Dodge Powerwagon firing up and three guys blasting out along the edge of a cliff in it, out to where the dead grass and seagulls were, where they dropped off the crate of apples, and then hightailed it back to the building that had all the controls and the radiation shielding in it. 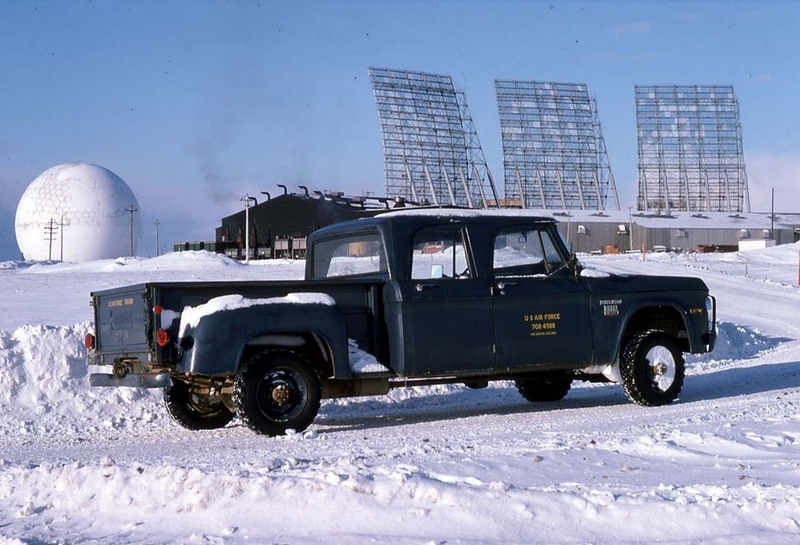 A Dodge Powerwagon, similar to the one mentioned in the story, with the Radar Antenna and the generator building in the background. Once they were all safely away from the radar beam, the switches were thrown, and the generators lugged as they once again struggled to generate the 1.2 megawatts of electricity needed to power up the radar again, and the electrons surged through massive copper wires, tubes, capacitors, and finally the antennas as that crackling hum came back. About twenty minutes later, they decided that the apples ought to be done, so there was another reason for ‘maintenance’, and once again the four wheel drive truck raced out to pick up the crate of apples. They were surprised to find the metal parts of the crate were hot. They were surprised, and delighted that some of the apples had popped and oozed syrupy apple juice all over the ones below. And they were overjoyed when the apples that done were smelled exactly like baked apples should smell. They got some gloves off the dashboard where they’d been warming up and loaded the crate into the truck and took it back to the control building, where the homesick friend was trying, with marginal success, to keep his head in his work. Dad grabbed one end of the crate, another fellow grabbed the other end, and a third one held the door open as they all came piling in. That smell, that wonderful, sweet, syrupy smell of baked apples came wafting in with them, and at first, their homesick friend thought he was imagining things, but then he looked up, and saw the crate, and smelled the apples, and he smiled, and then he laughed. They did indeed smell like baked apples should smell. Not only that, but they tasted just like baked apples should taste. And dad said he never had any as good as those baked on a windswept hillside on a remote island in the North Pacific, by a radar half a mile away. Don B., whose widow Brenda took time out of her day to listen to questions coming out of the blue about her husband, and then told me the story about the rainbow colored rats on Adak. Michael: You were the first to point me in the direction of Shemya. I’d heard stories of Adak, and had been focusing all my attention there – thank you so much for taking a fading memory and pointing me down a path that actually let me see the hillside my dad had talked about. Until that point, I didn’t even know what island out in the Aleutians to look for. Don E. – Many, many thanks for digging through your memories, sharing your stories, your patient explanation of everything, and the use of the photo in this story. Lucas – This picture of McDonalds Point did such a good job of putting into context how remote Shemya is. I’m hoping the combination of it for those who were right brained, and the data I was able to get from Von (for the left brained types) helped to make the picture complete. For those of you curious to see some amazing images from up north, take a look at Lucas’s site – there are some wonderful images up there. Buck – Thank you for your feedback, your friendship, the photos, and relating your experiences, they made it come alive, and made a very big world feel like a very, very small place. Barbara – thank you for your input, your thoughts, and all the items and stories on your website. They helped me see a place I could only see in my imagination. Of course, my dad, who remembered the story well enough to tell me so I could share it with you. And last but certainly not least, my family, whose patience as I researched and wrote it over the years can’t be overstated. Thank you. I couldn’t have done this one without you. Another one of the stories I told Michael about his heritage, this one about his Grampa, his step-great-Grampa, if there is such a thing, and a B-52. My dad was stationed at Castle Air Force Base in Merced, California in 1967, where the 93rd Bombardment Group was based. The 93rd at the time flew B-52’s, and they trained pilots and crews both in the planes and with simulators. They did this 24 hours a day, seven days a week. When they weren’t flying the airplanes, these pilots and crews were in the simulators, practicing. And my dad fixed those simulators. A few hours north of Merced is Santa Rosa, where dad’s mom and stepdad lived. Dad’s stepdad, we’ll call him “Grampa Bill” fancied himself to be an artist and photographer. This is a point that could be argued pretty heavily. And, it turns out, when dad and mom were a young couple and dad was stationed elsewhere, Grampa Bill wanted to take some photographs of mom that could at the very least be described as ‘inappropriate’. I won’t go into any more detail other than to say that when dad found out, he stormed in to see his commander and asked if he could have some leave so that he could go pour a goodly amount of chlorine into the gene pool. His commander declined the request, but sent someone to check on mom. She was fine, but that incident cemented the relationship between dad and Grampa Bill into something very, very simple: Dad hated Grampa Bill, with a passion. And honestly, as I see it, he was right. …or, put another way, watching Karma setting up a situation for you – whatever you call it, it’s almost impossible not to smile. Such was the case with dad and Grampa Bill. Dad worked with or near airplanes. Grampa Bill wanted to take pictures of airplanes. More specifically, he wanted to take a picture of a B-52, taking off. …and dad could make that happen. Now the thing was, Grampa Bill didn’t want to get a picture with a little camera he’d be holding in his hand. He wanted to shoot the picture with a camera that looked like a small accordion and came in a small suitcase. It was a film camera, the kind that uses film not in rolls, but in sheets, 4 inches by 5 inches in size. You had to look through the actual camera, not a viewfinder, and to be able to see the picture you were about to take, you had to have your head under a dark cloth to focus and frame the shot on the ground glass (think frosted glass) in the back of the camera. This image you saw on the ground glass would be upside down and backwards. When you were satisfied that it was framed right, you shoved a film holder into the back of the camera by the ground glass and from there on out you couldn’t see through it. You closed the open shutter and pulled out the slide protecting the film from stray light. Then and only then was everything set. If you opened the shutter at that point, the film would be exposed, and you’d have your picture. It was, as you can imagine, not a fast process, and you can probably figure out that it’s not a camera you would use to take images of, say, moving objects. But that’s precisely what Grampa Bill wanted to do. At Castle Air Force Base. …and an absolutely evil plot started festering in dad’s brain. He knew how much of the runway the plane would use up to do a normal takeoff. He knew that aerodynamically, while most planes take off with their noses pointed to the sky, when a B-52 takes off, the pilot actually has to aim the plane 2 degrees nose down to climb for the first little bit. More importantly, Dad knew the pilots flying these planes. Now, if you happen to be standing at the end of a runway – and on the other end there’s a half million pounds of raw power accelerating directly toward you out of a black wall of smoke created by not 1, not 2, but 8 of some of the most powerful jet engines of the time, there’s a good chance you’re going to leave something in your pants as it goes overhead – liquid or solid, doesn’t matter. If the person you asked to get you to this position knew the pilot, and also had a years long score to settle with you, those chances would likely lean toward the solid, and it would best be time to start digging yourself a hole. Dad worked on the B-52 flight simulators – so he knew, and was acquainted with, all the pilots who trained in them. And he knew this one. Every Air Force base has what they call a ‘perimeter road’ – a road that goes around the perimeter of the airfield. You are not supposed to get any closer to the runway than that road, and even while you’re on it, you’re not supposed to stop once you cross under the flight path. Dad and Grampa Bill got into one of the Air Force trucks and headed out toward the runway. Grampa Bill was having trouble believing his good fortune. Dad turned the truck off the perimeter road and up toward the runway, where there was a sign that started off with, “Authorized Personnel Only” and got significantly more threatening with every word, ending in something along the lines of “Deadly Force Authorized”. They drove past the sign. Dad drove Grampa Bill out to the end of the runway to pick out a good vantage point to take the picture from. Grampa Bill’s excitement grew. This was better than he’d hoped. He’d be allowed to get far, far closer than he’d dare dreamed. In taking him past the signs, dad also took him in past the approach lights at the end of the runway, so they wouldn’t clutter up the picture. When they stopped, he was almost beside himself. Grampa Bill proudly set up his camera, meticulously judging exposure, focus, depth of field, while 2 miles away, the B-52’s pilot got the his bird into takeoff position. He’d finished the pre-takeoff checklist with his copilot and pushed the 8 throttles to takeoff power. The plane shook as the jet exhaust made a black wall of smoke behind it. It took a few seconds for the thrust to build and the sound to reach the far end of the runway, but once it got there, the deep rumble of raw power stayed, getting louder with each passing second. The pilot held the plane back with its huge brakes and waited till they and all systems were cleared for takeoff. He’d told his copilot what was happening, and while they didn’t deviate from the checklists or official cockpit language, they did share a grin under their oxygen masks. They were given clearance, and the plane started to roll. Grampa Bill sensed the movement and tried to hold his excitement down. The ability to stand right at the end of a runway while an airplane, not just an airplane, but the mighty B-52 took off directly overhead was an astoundingly rare treat. Nearby, Dad stood by, calmly leaning against the front fender of the truck, also conscious of the opportunity of an astoundingly rare treat. But the nose was still pointed directly at Grampa Bill. The pilot, a major, kept the plane on the centerline, and felt the yoke slowly come alive in his hands as the 8 engines overcame inertia and brought them ever closer to takeoff speed. Grampa Bill saw the tremendous contrast between the black wall of smoke, the white and silver plane, and the incredibly bright landing lights and wondered, for a split second, how that would affect the exposure setting on the camera. The pilot felt the rumbling cease and the plane smooth out as the wheels left the pavement – and then aimed the nose down the 2 degrees, at a small tripod with a black box on it just off the end of the runway, to start the climb. At that moment, Grampa Bill’s thoughts of exposure, focus, and timing were suddenly replaced with a rather urgent need to decide between liquid and solid. Beside the tripod, Grampa Bill tried to be manly and stand his ground, but from his angle, the plane just couldn’t climb fast enough, it wasn’t even aimed up – in fact, it looked like it was actually aimed down, right at him. Those 8 engines, inhaling more air in a second than he breathed in a year, looked like they were going to inhale him, vaporize him, and blast the remaining bits into that huge wall of smoke behind the plane. In the cockpit, the pilot thought he saw movement near the tripod just before it disappeared below his windscreen. Below, the plane’s shadow passed with the fury of a tornado, the violence of an earthquake, and the heat of a blast furnace. The jet blast tore the canvas top off the truck they’d driven out to the runway in, knocked the camera and tripod over, and sent them all diving for whatever cover they could find. (This being an airbase, the only cover available was the truck they’d come out in). And in the decision between liquid and solid, a compromise was made. The last time I saw them, all the pictures Grampa Bill had taken were being stored in boxes in a chest of drawers in the attic. They’re 4 x 5 negatives – or sometimes 4 x 5 positives. I’ve looked through them all. And there’s no picture of a B-52. (note: here’s a short 2 minute video of several B-52’s taking off – from beside the runway – not at the end of it, and they’re taking of higher than the Major did – but it’ll give you an idea of what it was like.